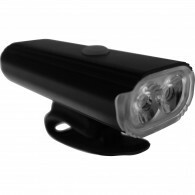 buy Pulse Luster front light online now from Arthur Caygill Cycles. We currently have Pulse Luster front light in stock. If you have any questions about Pulse Luster front light, please get in touch. With it’s built in rechargeable battery, the LUSTER is a compact little unit that will sit neatly on even the busiest of handlebars. Using 2 Super Bright CREE LEDs we’ve achieved a massive 640 Lumen output ideal for even the darkest streets. When you do get to more well lit areas, the light has 8 different settings (4x constant light, 4x flashing) allowing you to be visible for up to a whopping 64 hours!! Needless to say, we’re sure you’ll burn out before the LUSTER does!